Before we begin to today I have an apology to make, I created these projects before the retirement list was posted and unfortunately several of the items in todays post are on that list and might be unavailable to purchase. I’ll usually have projects that use current product but as I work in advance I didn’t know at that time what would be retiring. I’m sorry if this causes any frustration and if you see anything you love, buy it now before it’s gone! …a set of notecards using those scraps and a few from my other projects. 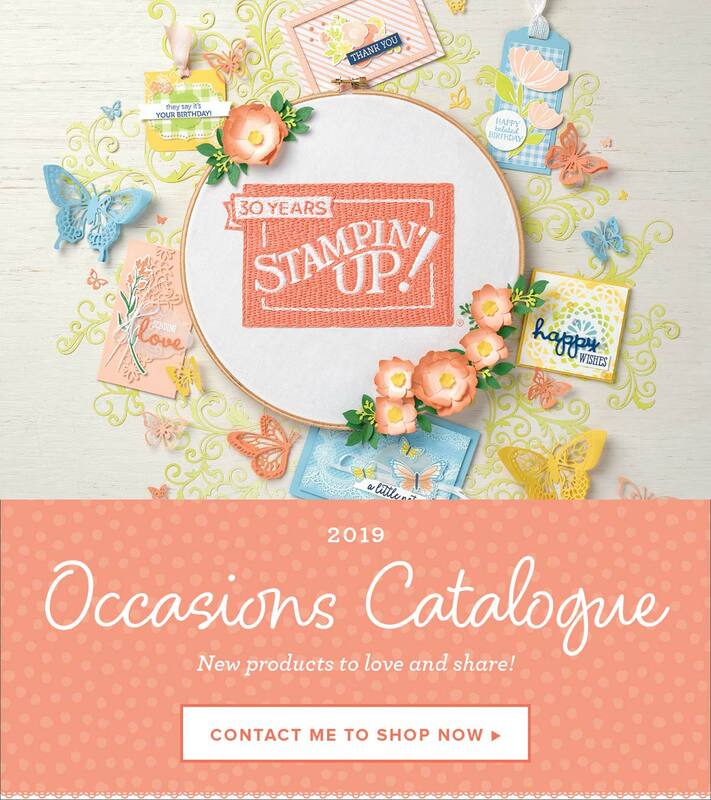 The bases of the cards are Stampin’ Up!’s Whisper White Notecards (item# 131 527), I love these, they come as a pack of 20 with envelopes and are just $10.50 AUD so a little over $0.50 each. They are smaller than a standard card at 12.7 x 9cm or 5 x 3-1/2″ and just fractionally to small to be posted (I have only just realised this and might have mailed a few…oops!) but are a great size to add to a gift because they look like a “proper” card, not just a gift card. This one was my first and is my favourite, maybe because it’s so simple to make. I punched out squares with my 1″ square punch (unfortunately retiring, but you could easily trim these with your trimmer), rounded two opposite corners and adhered them to the card front alternating the corners. A heart from the Itty Bitty Accents Punch Pack (also retiring and I highly recommend you grab this set, it’s great!) was punched in Blushing Bride Glimmer paper and popped up on part of a dimensional and a sentiment from Circle of Spring stamped in Blushing Bride ink. For this one I simply flagged each end with the Triple Banner punch (it’s designed to cut 1″, 1-1/2″ and 2″ wide pieces) and staggered their heights. A few flowers in Rose Red cardstock punched with the Itty Bitty Accents punch pack (this is my favourite small flower, I’m so sad to see it go) and pearls in the middle are the only embellishments. A greeting from the same stamp set was stamped in Mint Macaron to finish it off. The last card uses the entire wreath stamped in Basic Grey and water coloured with Blushing Bride and Mint Macaron using an aqua painter. A few pearls and a layered banner in glimmer paper and DSP are the only embellishments. The sentiment actually says “Hello, Spring” but I masked the word spring to stamp just the hello in Mint Macaron. Now I look at it I think I should have left the entire sentiment, but at the time I thought a hello card would be more versatile. I added liners to the envelopes using the Envelope Liner Framelits (no longer available), these did not use scraps but most of a sheet of 6 x 6″ DSP each but I’d rather use it than hoard it, so it helps me use up my paper and co-ordinates with my cards perfectly. I hope you like these ideas for using up scraps, they were simple to make, very cost effective and used up bits and pieces that might have otherwise made their way to the bin. I still have some scraps left and will try to come up with some more designs so they don’t go to waste, maybe I should make a scraps kit, that might be fun for a beginner or kids or anyone really, I know I enjoyed the challenge of using up leftovers in different ways. I have one final project to share in this Mother’s Day set, I thought my notecards needed some pretty packaging so I designed a presentation box to give them as a gift. I hope you’ll come back to see and remember, if you want anything on the retirement list don’t wait or it might be gone. Previous Post Bag or Box? Next Post Wrapping it up!